On March 7th, 2018 at approximately 7:19am, the Greenville Police Department responded to the Greenville Walmart located at 1501 Wagner Avenue on a report of an armed robbery. 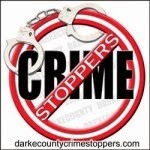 Throughout the investigation, it was discovered that a female subject entered the store and, a short time later, approached two clerks stated she had a gun and demanded money. An undisclosed amount of money and property was taken by the subject who fled in a vehicle. The suspect and another subject were later arrested by another agency on unrelated charges. One count of aggravated robbery was filed with the Darke County Common Pleas Court on the suspect.